These are two W.S. Deans 2-Pin Female Ultra Plug Connectors. This is the Futaba BR-2000 Battery Checker/Discharger. Checks NiCd and NiMH receiver batteries and 1 cell Li-Ion batteries (voltage display only). PLEASE NOTE: GOING FORWARD WE CAN NO LONGER SHIP BATTERIES USPS PRIORITY MAIL. THEY MUST SHIP UPS GROUND. WE ARE SORRY FOR ANY PROBLEMS THIS MIGHT CAUSE. Featuring a monolithic vertical stance, this charger saves valuable bench space by providing two complete charging circuits, each with its own dedicated 80W integrated power supply in a footprint equal to most single charger solutions. Having two dedicated power supplies in one compact package means both, channels are able to receive 80W of power, ensuring you are not diluting your amp rate when charging a second pack. 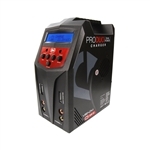 This is the DuraTrax Onyx 240 AC/DC Dual Charger with Backlit LCDs. Excellent for electric powered models which use two NiCd or NiMH batteries simultaneously, or modelers who rotate through multiple batteries while at the field or the track. Less time charging batteries - more time having fun! 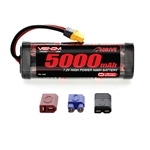 Charge currents of 800mA, 1.5A, 3A, and 5A plus 4-8 cell NiCd or NiMH compatibility make this charger great for batteries for 1/18 to 1/8 scale electrics, nitro receiver packs, and even transmitter batteries! A tiny, lightweight switching AC power supply is built-in, DC input capability and twin LCDs with blue backlights make this charger easy to transport and use in any environment.